Thanks to plug-in hybrid drives, e-mobility has been a reality on the roads for a long time. Provided there is sufficient battery capacity, vehicles equipped with these drives are full-featured electric cars for everyday use. Martin Westerhoff studied technology journalism and writes about vehicles and technologies since then. He has a soft spot for motorsports and racing cars. Vehicle launches from the major automakers are currently being watched very closely. The reason for this is that many of these automakers are unveiling their first all-electric cars ever and it's all the media headlines, driver reports and comments in social networks are talking about. Though this attention is understandable, the fact is electromobility has been around for a long time, even if mostly available in mid-range and luxury vehicles. Regardless of whether in a normal passenger car or in an SUV, these vehicles with plug-in hybrid drives and additional batteries give drivers the choice of driving in electric mode or powering the vehicle with the combustion engine. Porsche recently announced that in the first quarter of 2018, already 60 percent of all European Panamera customers had opted for a plug-in hybrid (PHEV). The battery capacity for PHEVs has so far been configured to operate at distances of up to 50 kilometers solely on electric power. When drivers connect their plug-in hybrids to the power supply to recharge, they are essentially driving an electric car. For many drivers, this type of vehicle fits in well with their lifestyle and daily routine. ZF’s current multi-ratio and dual clutch transmissions are helping to drive the success of these externally chargeable vehicles. The plug-in hybrid variants of both transmission types combine up to eight speeds in the combustion engine with a compact, powerful electric motor. The compact electric motors installed in the transmission housing have an output of up to 100 kilowatts, which is the equivalent of 136 hp. This allows the electric drive to reach considerable speeds of up to 140 kilometers per hour. ZF therefore expects the production of its hybrid transmission to increase tenfold by 2023. “This is the only way for larger passenger cars to achieve the specified CO2 targets,” adds CEO Wolf-Henning Scheider when explaining the rising demand. will be featured by the next generation of plug-in hybrids. Hybrid technology has earned considerably more respect than it is currently getting from politicians and the media, says Scheider with a hint of regret. He adds, “We are calling the coming generation of the plug-in hybrid EVplus. This designation reflects the newly defined importance of both drive types: The electric motor now covers most of the drive performance (EV) while the “plus” represents the combustion engine." These vehicles can now guarantee an electric drive range of up to 100 kilometers. First and foremost, however, is the fact that this technology needs to be more widely distributed. Because only when less expensive vehicle classes are equipped with these motors will their benefits really be felt in many passenger cars which make up the majority of traffic on the road. Schematic screen display of both drives in the ZF hybrid test vehicle. If both drives are active, then four-wheel drive is actuated. Also the ZF 8DT dual clutch transmission can be turned into a hybrid configuration by integrating an electric motor with an output of 100 kW. The next generation of plug-in hybrid transmissions produced by ZF will have an output of up to 160 kilowatts (218 hp) and will come with integrated power electronics . Due to such a high electric power output, automakers and their customers will enjoy a full-fledged electric drive. As a result, the combustion engine can be made smaller and more compact. Even if the plug-in hybrid technology might mean a generally higher purchase price for end customers compared to a conventional driveline, the savings in operating costs will more than make up the difference later. The German automobile organization ADAC can attest to the fact that many current plug-in hybrids have lower operating costs than comparable gasoline models. Future transmissions from ZF will make it possible to reduce fuel costs by up to 75 percent, measured in the new WLTP cycle, which has been mandatory for all newly registered passenger cars since September 1, 2018. WLTP refers to the globally standardized test procedure which covers considerably more acceleration and braking actions than its predecessor procedure. It shows how effective the hybrid technology is, for example, in converting braking energy back into power. This year ZF has demonstrated that it understands how to offer plug-in hybrid technology for every vehicle drive configuration. A standard compact SUV for the Indian market was used as the basis for an interesting prototype vehicle. A ZF project team installed an internally developed electric axle drive on the rear axle. This electric drive is networked with the module for automating a manual transmission and the diesel engine installed with a front-transverse configuration. Electrification transforms the automated manual transmission (AMT) into an electric AMT or eAMT. An additional aspect of this design is the fact that four-wheel drive is available if needed. “It demonstrates that a full-featured plug-in hybrid drive along with comfortable automated gear shifting can be installed relatively easily in inexpensive vehicles”, explains Norman Schmidt-Winkel, function developer in the Electric Traction Drive Business Unit at ZF. Projects like this underline the fact that the company is open to any technology. 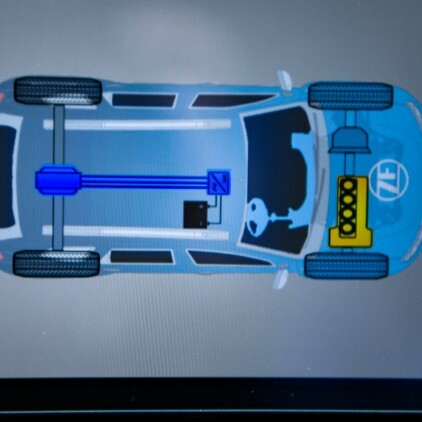 With its multitude of efficient transmissions and drive solutions for conventional, hybrid and all-electric drivelines, ZF is doing its part to ensure that as much fuel is saved in as many vehicles as possible while also reducing carbon emissions. 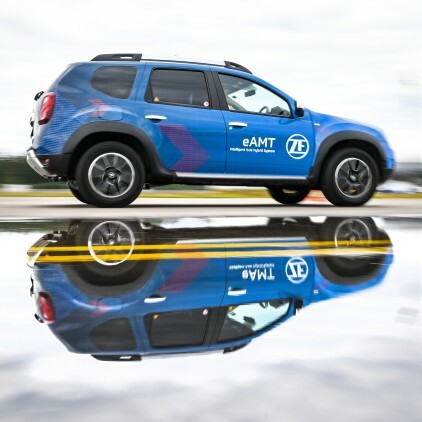 The ZF prototype vehicle based on the Indian Renault Duster combines the combustion-engine-powered drive in front with an electric axle drive in the rear for maximum efficiency. Urbanization is a megatrend – with negative consequences for air quality and quality of life. Only tailored concepts deliver an efficient contribution to climate protection. ZF offers a wide range of solutions and technologies.